I always feel compelled at the beginning of these posts to remind the rest of the league: I swear, I’m not trying to sway your personal valuations or opinions. I just want to riff on fantasy baseball. If I happen to use a player on your team as an example and view him unfavorably, oops. I would hope we’re all capable of coming to our own conclusions. It’d be pretty boring if we all had exactly the same valuations. So, having said that… how valuable are good-not-great players at super top heavy positions? Or positions that aren’t even top heavy, but rather mediocre all throughout? Two positions immediately jump to mind here, and that is catcher and shortstop. Let’s look at shortstops. Carlos Correa was our league’s highest paid shortstop at $81, so it’s nice that he’s pictured here. He was also the fourth highest paid hitter in the league, which means he’s being paid to be an absolutely, unquestioned transcendent talent and fantasy producer. The obvious thing that jumps out is that four shortstops who were practically free either at auction or in our minor league draft currently sit atop the landscape at the position. In fact, Trevor Story, Jean Segura, Aledmys Diaz, and Eugenio Suarez cost just 11.1% of what Correa costs combined. Granted, we’re only 19 days into our fantasy schedule. But our regular season is 148 days long, so we’re already over 12% of the way through the season. No one would be surprised if Correa ends up as his position’s best producer by the end of the season, but what we have so far shines an interesting light on the shortstop group. It has paid to not pay for these guys. Behind Correa in terms of salary at shortstop are Xander Bogaerts ($58), Corey Seager ($54), and Troy Tulowitzki ($46). Bogaerts ranks ninth in scoring, Seager ranks 28th, and Tulowitzki is 29th. For the sake of argument, let’s just look at those three guys, whose average salary is $52.70, or $53 to simplify. Of course, no one went for $53 at auction, but we did have Francisco Liriano go for $54 and a couple go for $52: Kyle Schwarber and Edwin Encarnacion. Some big names and reliable fantasy producers that cost in the mid-to-high $40 range: Cole Hamels, Justin Upton, George Springer, Sonny Gray, Chris Davis, Jose Altuve. Hypothetically, if that list of players played the same position as Bogaerts, Seager, and Tulowitzki, would they have gone for less? I’d argue not. There are pitchers mixed in, so the positional view is wonky, but what if the shortstops were left fielders instead? Is Seager getting $54 to play the outfield? Hell, right fielder Matt Kemp cost $11. If Seager played the same spot, are you really paying him $43 more? Go look at Kemp’s last two years worth of stats before answering, because they’re likely to be better than you think. In terms of having ever accomplished anything worth banking on, only Tulo has done it out of this group for more than a single season, but his age and injury concerns chew up some of his value. The argument I’m making is that Bogaerts and Seager had “being a shortstop” baked pretty heavily into their price. Age was baked in there too, I’m sure, but whatever. Bogaerts was the top scoring shortstop in our format a year ago, so good for him and all, but Jhonny Peralta ($7) was number two and Brandon Crawford ($14) was number three. 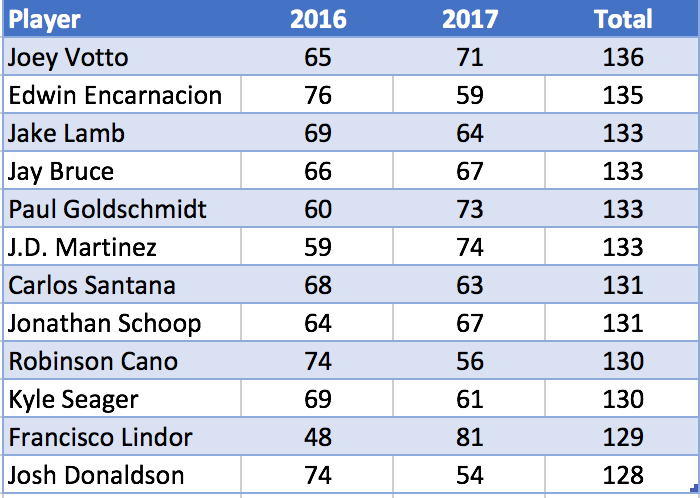 Peralta being hurt to start the year is a wrinkle, but those guys got pretty heavily punished for not being 23-years-old and presumably keepable for a decade. Maybe age was an even bigger factor than position? Speaking of Bogaerts and 2015: he scored 810.5 points last year and yes, he led the way for shortstops. But compared to all other hitters, he ranked 55th. The two guys below him: Nick Markakis ($4) and Brandon Belt ($12). The two guys above him: Evan Longoria ($20) and David Peralta ($17). So you could have literally bought the four hitters directly surrounding Bogaerts in 2015 net points and still had $5 left over! Also, while Bogaerts was the 55th highest scoring hitter last year, he’s the 17th highest paid hitter this year. He’s also not priced to be immune from greed and his salary is going to grow by $2 a year. So… yikes. 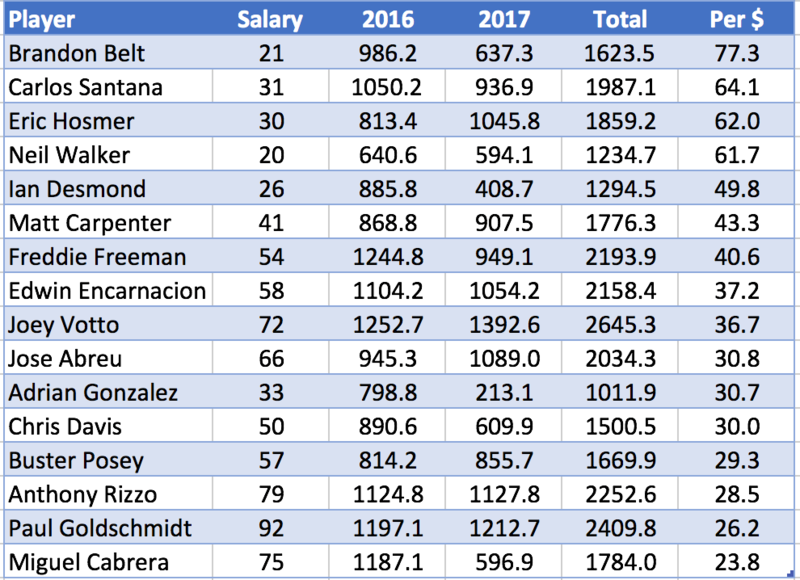 Just as easily as it is to envision that $81 Correa being tops at short in August, it’s not crazy to see Bogaerts and Seager in the top five or even three. But it also seems fair to suggest that even if these guys lead the charge at their position, they’ll come out behind in the greater landscape of hitters at large. Crush Davis, who you’ll recall went for less money and was just the second best right fielder (but also has 1B eligibility) behind MVP Bryce Harper, averaged 55.835 points per week. Kole Calhoun ($10), the 16th best RF, averaged 38.805 points per week, a difference of 17.03 between second best and 16th. So, through that lens, you’re better off just having the better overall player in Davis than you are having the top guy at a weak position. Having Davis instead of Bogaerts, again in this admittedly simplified example, gives you a 4+ point weekly edge over the worst possible starter at each position. Starting Davis/Aybar gets you 83.16 a week. Starting Bogaerts/Calhoun gets you 79.33. Also, the total cost of Davis and Aybar is lower than the cost of Bogaerts and Calhoun by $19, meaning that, at least theoretically, not overpaying for perceived positional scarcity affords you more resources to help your team. Personally, I like to view players across their broader peer groups: pitchers against other pitchers, hitters against other hitters. Yes, a player may be the third best shortstop or the fifth best catcher, but that ranking is not interchangeable across positions. Buster Posey is so good, he does not have a peer group at the catcher position. He is a tier, the two tiers below him are filled with chirping crickets and sawdust, and then other guys start falling in line after that. Yeah, you’d like to have whoever is second or third best, but if you have to settle for that 16th guy, it probably won’t be overly painful. The difference is negligible. Future President Beachler’s team here is well rounded out as you can see. He found value as he always does in those, who by most in fantasy baseball, are considered old. He mixes together hitting and pitching really well and has a very flexible roster. 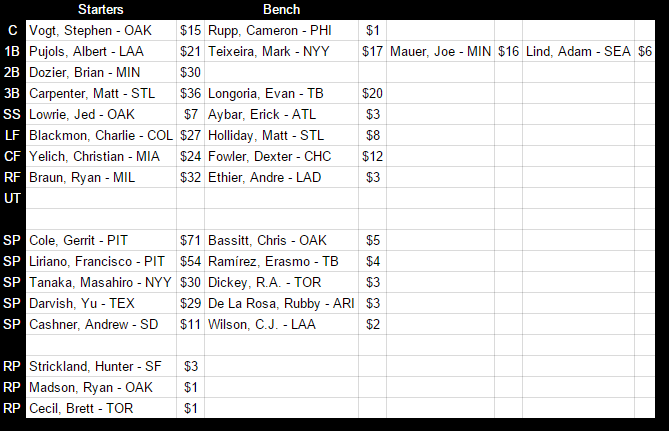 I particularly love the value found in Yu Darvish at $29 and Albert Pujols at $21. Matt Carpenter and Ryan Braun stand out as guys who you can figure to be leaders at their respective position. Nobody would be surprised by Brian Dozier or Pujols having an up-year and sneaking into that same tier. Dan’s team does not have that superstar on offense, but his offense is solid. He did not punt at any of the nine positions and has several guys he can stick at the two utility spots with ease. The missing piece here taking his rating from Very Good down to Good is the lack of a star hitter that should carry week to week. Balance is great, but the entire line up could finish ranking in the 6-10 slots at their positions and that might not be enough. Gerrit Cole is the highest paid player on the roster is a worthy choice as he should be a great number one starter. Francisco Liriano is one of my favorites. Yu Darvish was a bargain if he comes back healthy in 2016, and Tanaka is good when he is pitching. His top four is enviable by most teams in this league I would bet. Andrew Cashner seems like a quality bounce back candidate. Dan’s staff is held from a rating of greatness over the bullpen. If Dan punted anywhere it is here. He spent five dollars on three guys. While they could all be serviceable, he is likely banking on streaming relievers in hopes of finding something good. All of Dan’s hitters have a backup that is above replacement value. Perhaps if Vogt gets injured his catching situation gets a tad hairy. Overall having Evan Longoria, Matt Holliday, Mark Teixeira, and Dexter Fowler on the bench is a lot of fire power. Adam Lind and Joe Mauer are good in utility spots if they are called upon. Dan’s flexibility with guys like Carpenter qualifying at two spots and his outfielders overlapping well, makes the Beach Bum squad potentially scary as a competitor. It is not unthinkable that both of Darvish and Tanaka do not pitch well in 2016. While Tommy John surgery has not been as scary as it was in the past. It is still a concern. Toss in ideas like perhaps Cashner has pitched his best already, or punting bullpen is a poor idea, and things could get middling or even sour quickly. Maybe baseball is a young mans game and Dan’s older roster just doesn’t hold up. In short, Dan’s team is a candidate for being a contender in 2016. His roster allows him to suffer some unforeseen blows, plus has upside in previously injured player returning to stardom. He just has so many choices to make that make a lot of sense. Depth might be the best feature, and it just fits into this team so beautifully that even if nobody gets hurt, the potential route to maximize the entire roster is clear here.